Remember, this only reflects what the tech spear-head internet users are browsing with. Edit: Does anyone know what can have caused the pothole in the IE curve, back in 2002? Posted at 18:13. Categories: browsers, Internet Explorer. Both comments and trackbacks are closed. “Does anyone know what can have caused the pothole in the IE curve, back in 2002?”I’m sure your question is rhetorical, but just in case. Looking at the graph, it would appear during the same period that Mozilla took life. No, I didn’t mean it as a rhetorical question. 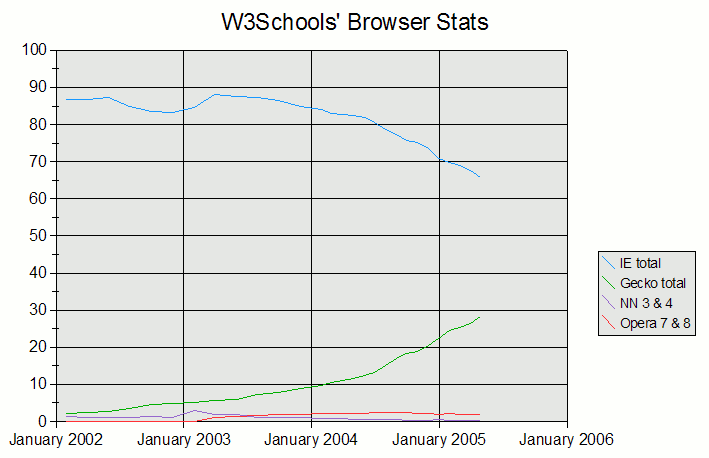 I doubt the launch of Mozilla could have caused such a den’t in IE’s numbers, even at a website like W3Schools. Anyone agree/disagree?